According to a poll, 74 percent of Tea Party supporters are very enthusiastic about voting in upcoming midterm elections. New poll shows large "enthusiasm gap"
Washington (CNN) -- As Election Day gets closer, the "enthusiasm gap" is getting clearer. A new poll from the Washington Post, the Kaiser Family Foundation and Harvard University finds a huge disparity when it comes to which voters are motivated to vote in upcoming midterm elections. According to the poll, 74 percent of self-described Tea Party supporters are "very enthusiastic" about voting in the elections. Contrast that with just 43 percent of Democrats and 57 of Republicans who say the same. Late last week, a separate CNN/Opinion Research Corp. survey found only a third of Democrats are enthusiastic about voting. That's good news for Republicans. 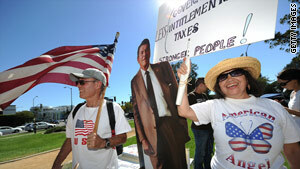 Time and again, the Tea Party movement has pushed the most conservative candidates to victory in Republican primaries. With the enthusiasm gap on their side, GOP leaders are confident these Tea Party Republicans can win in general elections as well. "Well, I don't see them [polls] closing on the Democratic side. ... You look at the enthusiasm gap, much stronger on the Republican side, even than it was in 1994, much stronger on independent voters voting for Republicans, stronger than 1994," said California republican Congressman Kevin McCarthy on CNN's "State of the Union" on Sunday. Democrats are warning their base voters that a new, more conservative Republican Congress will block the president's agenda. Brushing off the "enthusiasm gap," Pennsylvania Gov. Ed Rendell told CNN, "Democratic voters aren't as wildly enthusiastic as the tea partiers are and there's no question about that. But remember, there's an age-old adage that a tepid vote counts the same as a wildly enthusiastic vote." Not only are Democrats not as enthusiastic as Republicans, they're also not quite as unified. In races all over the country, conservative Democrats are distancing themselves from their own party leaders including the president and House Speaker Nancy Pelosi. Not a problem, say Democratic leaders. "There are issues where they [Democrats] stood with the speaker and the president, and there are issues where they opposed the speaker and the president. That's their job," said Maryland Democratic Congressman Chris Van Hollen. On the Republican side "you have this ideological purity test, and it's being moved even farther to the right by the Tea Party candidates," Van Hollen said.